This week - we are showing off our favorite vacation spots. One of my favorite places ever is Gulf Shores, AL. We are headed there soon!! But my other two VERY favorite places I've been are NYC and Kauai. 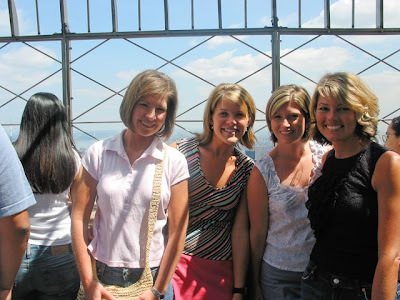 In May 2004 - I went to NYC with 3 of my best friends. My friend Megan actually won the trip so everything was free but our food. We went to 2 Broadway shows and did all the sightseeing stuff. Here are Laurie and I in front of Lady Liberty! I love this picture with the city behind us. This is Laurie, Hillary, me and Megan. This is one of my very favorite pictures of the four of us. I have it framed in my kitchen. 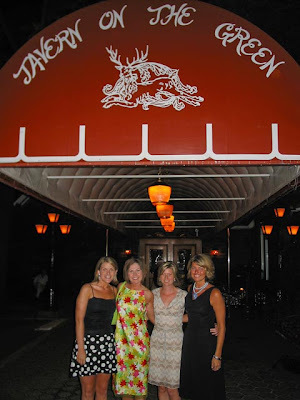 We ate at Tavern on the Green that night. That was SUCH a fun trip. I want to go back SO badly! And this is a little heaven on earth. 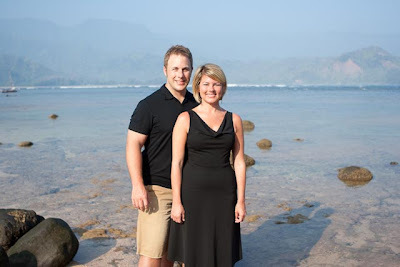 Scott and I have been to Kauai twice and we love it. We stayed at the same hotel in the same room both times and this was our view out our window. Can you understand why we requested the same room the second time. This is the night we ate a little hole in the wall restaurant and we were sitting literally 10 feet away from Pierce Brosnon and his family. Actually Pierce (James Bond) held the door open for us as we came in and I nearly passed out. We tried to be very "bachelorette" and took a helicopter ride to see the island. Only on the show it seems so romantic and in reality we were both about to lose our breakfast and I had to keep my eyes closed and hold a barf bag most of the ride. ha! But this was the view when I opened my eyes. We waited until the last morning to try and take pictures in front of our beach and it was so foggy - you could not see the mountains or view. Oh well - lesson learned. Hopefully we will move to Kauai one day and you can all come visit us. Now - show me your favorite vacations so we can all see where we want to visit next!!! Yes, NYC is fantastic - and I do adore Hawaii - but I have only been to Maui! I've never been to NYC, but it's high up on the list of places I want to go! Great pictures and memories too!!! 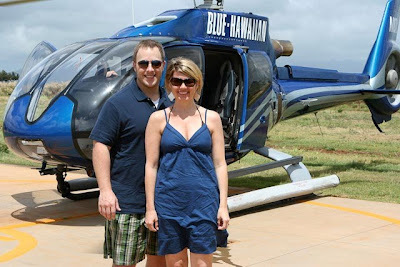 Patrick has a friend who flew for Blue Hawaiian helicopters. 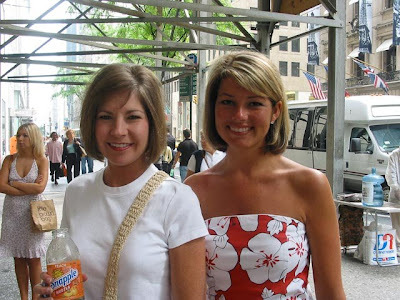 I'm cracking up that you and your NYC friends all have the same hair! Beautiful pictures! Oh, I *love* NYC!! We have been three times since we've been married. My best friend (I would have said "BFF" but didn't want to sound like an utter dork) lives in Manhattan, so we always have a place to stay. But now she has a baby and we have two, and I just haven't been able to bring myself to go with kids. First of all, it's a 13-hour drive (or an expensive flight b/c we'd have to pay for 3 or 4 tickets), and plus, I know it would be a *totally* different trip with kids, and I don't know that I'm ready to let go of the magic that lives in my memory. Is that dumb? Oh, and we ate at Tavern on the Green one year and HAAAAATED it! It was so expensive (even at lunch) and pretensious (sp?? ), and the food wasn't even good! SAD!! Cute! You look so tan. Love your pics always! I live on the Alabama coast about an hour from Gulf Shores. Would love to meet you guys briefly if that is an option! Your vacation pics are great! I've never been to either locale, but hope to some day! We are huge fans of Gulf Shores. Not a bad drive from Arkansas! It is also an easy(ier) drive from Kansas City. We did FL this year and were disappointed. Oh, the water was warm and their were no jellies to contend with, but we truly missed the sugar sands of the Gulf Coast and Panhandle. We're already making payments to the gal we rent our condo from for next year! Ha!!! 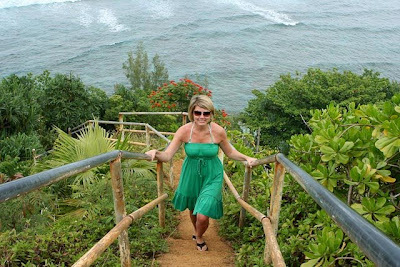 Beautiful pics...you made me want to take a vacation to Kauai! Now! Gorgeous Hawaii pictures!!! We're about to go to Gulf Shores, too. We actually stay in Orange Beach. This is a great time of year to go..it's not as crowded, no jelly fish, and a little bit cooler. Have a great time! Can't wait to visit! Where are you staying when you go to the Gulf? My mom's entire family(all my cousins, aunts, and uncles, and my gma&gpa) stayed in one of those beach houses, that my grandmother got to stay in for a week as a present for her retirement from her company. It's call Martinique On The Gulf. It was really cool, the house came with sand toys, and a golf cart that we could drive around! It was very cool! I too was pregnant in Kauai--four months along with my first. Loved the trip. For the most part. But I should say, if the Napali Coast catamaran tour company says pregnant women should not cruise with them, for the love, please BELIEVE them :). As my dad said (who was not pregnant, btw): "I haven't paid that much money to be that sick in a long time." 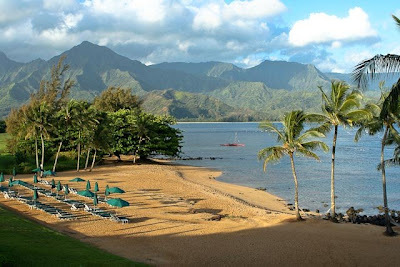 What hotel did you stay at in Kauai? Just gathering information for my future dream VaK! Thank you for sharing/blogging. I love reading about the paths other Jesus lovers walk! 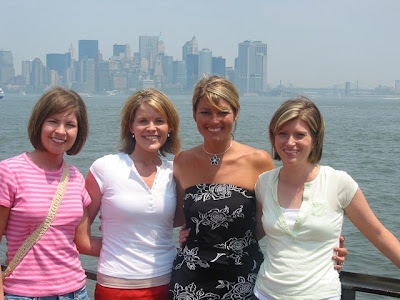 I loved NYC too...I went YEARS ago with our dance team, but we ate at Tavern on the Green too and had a blast! We also saw Phantom of the Opera and a show by the Rockettes...SO COOL!!! What is H & M? Love your pictures...my parents got married at Tavern on the Green (well, 28 years ago!!). Love all your pictures Kelly! We lived in Jersey for 4 years and I LOVED going to the city for the weekends! 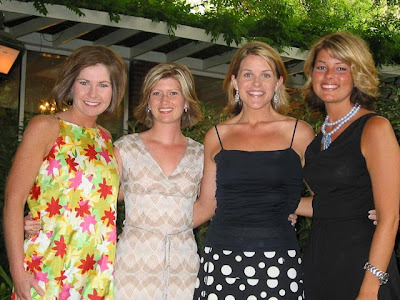 Now that we are living in the midwest I go back to hang out with my best girlfriends! It is a great city! Never been to Gulf Shore or Kauai, but will add them to my list! I just recently moved back to Atlanta from Gulf Shores. Just a couple great places to visit since you are going soon. You may have already been to these places, but what the heck. One of my husband and my favorite restaurants is Jesse's in Magnolia Springs (straight down 98 and you will see signs)...being a southern girl you would really appreciate this place! Also, Fairhope, also down 98, is one of the cutest towns I have ever been to...Absolutely love this place! Tons of cute shopping, adorable bookstores, and yummy restaurants. Have fun on Vacation! the tan...I love the tan! I wish I could tan like that. Being way to Irish I only burn. So sad! ps - and now I REALLY want to go to Hawaii! My two best friends and I have been talking about a trip to NYC. Looks like you had a great time. i found this blog hop through a friend of mine and i just think it is such a fabulous idea. i chose hawaii too but we went to oahu. can't wait to participate in more hops. looks like you have been so many fun places! We also loved NYC! I couldn't get your button to work on my blog??? Have others had difficulties or is it just ME??? I LOVE Hawaii!!! I've been to al 4 bigger islands and my favorite is Kauai. It's much more lush. your pictures are fabulous!!! so great to see everyone's beautiful vacation spots! great ideas for us. 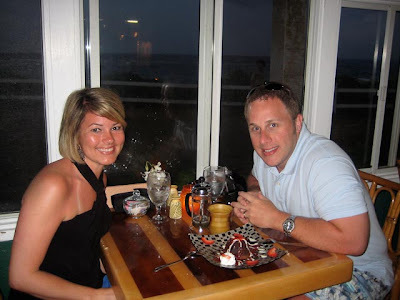 we want to have a 10year get away in a year and a half and love seeing all over through your blog! i am having a problem posting the show us your life button, any ideas? only get a box with a red x on my blog. i've tried copy and paste a hundred times. i love your pictures..gulf shores is so fun too, we are leaving tomorrow to take our 7 month old..
Kelly, I want to go to NYC one day. I think it would be great. Hawaii doesn't sound too bad either. We live 2 hours from Gulf Shores and go very often! What are your favorites to do there? I'm excited that you and your family especially baby Harper will be so close to my neck of the words..It's like a celebrity, haha.. I accidentally posted this earlier on your costume blog. Oops! I LOVED that trip but would love it even more if I were still that THIN! LORD HELP! you're going to be 2 1/2 hrs away from me!!!!!!!! have so much fun! go eat at lulu's and tacky jacks!! I have to ask...was that the Princeville Hotel Resort??? We stayed there last time...our favorite vacation EVER!!! I'm spoiled now with that hotel and private beach! My family and I are going to Gulf Shores in exactly 22 days (Labor day wk). We go every year and LOVE it. We actually stay in Orange Beach. Hope you have fun on your trip. You look so cute in your trip to NY. I have always wanted to go...maybe one day! Girl, you are TINY in those pics of New York!! You look fabulous in all your pictures! Thanks for sharing!! 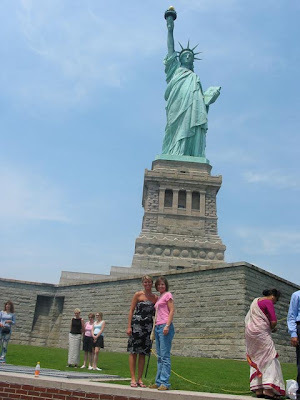 I enjoyed NYC too when we went there! I also went to Hawaii (but Maui only) when I was in college. I hope to be able to go there someday again with my husband!! love NYC, but haven't been to Kauai... only Maui. gulf shores is my favorite vacation spot though. We are taking our family to Gulf Shores on Labor Day.If I see you, I have to get a peek at Harper in person but I will try not to embarass you and act all star struck! Great idea to share favorite vacations. I have so enjoyed clicking around and getting trip ideas. Thanks! I'm so going to have to join in on this! I love NY as well...and Hawaii!! I've been to Oahu and loved it..ugh I wish I wasn't a stupid teenage who forgot to take pics! Thanks for sharing some great pictures. I think I may have to join you next week for what looks like a fun meme. My sister has two condos that are just a year or two old in Gulf Shores that she rents on West Beach Blvd. if you are ever interested! We go there often & it is Heavenly! One is a 3 bedroom & the other is a 2 bedroom. Hawaii is on my "someday!" list! My in-laws LIVE in Gulf Shores! Gotta love it. We are headed to actually vacation there in September! It feels like our second home. Hope you have a great time...maybe we'll run into each other! I grew up in Hoboken, NJ, right across the river from that beautiful NY skyline. I love going to the Statue of Liberty, walking in NY, and just experiencing the city life. I wouldn't want to live there, it's just fun being from that part of the country. I now live in England where I discovered H & M and I noticed on our most recent trip to NYC (back in November) that they also have H&M. How cool! 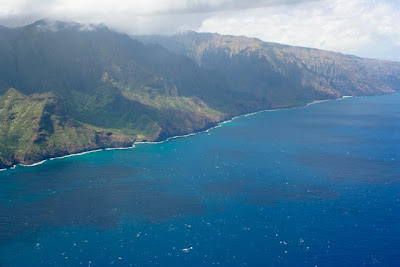 As far as Kauai goes, I want to go to anyplace in Hawaii. It's been a dream of mine. One day, Lord willing, our family will get there. Kelly, thanks for hosting favorite vacation spots. I enjoyed your pictures of NYC and Hawaii and I'm so happy you love the Gulf Coast. That's where I live and I do love it so much and don't want to live anywhere else. However, I enjoyed posting about the mountains this week. My husband ran into Mr. James Bond himself in Kauai too ... three years ago. His son was with him and was jumping around bushes pretending to shoot people with his fake gun using his hands -- TRUE STORY!!! Oh my gosh! You SHOULD move to Hawaii!